At Bold Park Community School we actively encourage our children to have a voice, understand and recognise their feelings and build healthy relationships. These are central to our teaching philosophy and at the heart of our Mutual Respect Policy. In support of this, and for many years now, our educators have had professional development in the Protective Behaviours WA (PBWA) program and incorporate teaching strategies from this program into their daily classroom practice. Child protection is a sensitive and challenging area, but it is a fundamental and non-negotiable responsibility of schools to provide a preventative curriculum, under the Department of Education Child Protection Policy. This year, alongside our embedded Protective Behaviour strategies and Mutual Respect Policy we will be implementing the Keeping Safe: Child Protection Curriculum (KS:CPC). The KS:CPC is an evidence-based, best practice curriculum developed collaboratively with child protection specialists, teachers, educational leaders and other professionals. It covers a range of concepts including new additional material on contemporary issues such as bullying and cyber safety. It has been developed by the South Australian Department of Education and is recommended by the Association of Independent Schools WA (AISWA) as a comprehensive and excellent child protection curriculum that allows for a whole school approach extending from the age of three to senior secondary schooling. 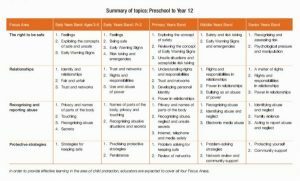 The curriculum is based on two main themes, which are similar to the Protective Behaviours themes and are presented through topics and activities. The Keeping Safe: Child Protection Curriculum has been designed to teach children and young people to recognise abuse, tell a trusted adult, understand what is appropriate and inappropriate touching and ways of keeping themselves safe. All our educators have this year, received explicit training in the KS:CPC. For both families and teaching staff, the issue of child protection is an emotive topic that can generate strong feelings and reactions. We may feel that this is something that could ‘never happen to our children’. Or, as a child we may have had an experience that caused us harm; or it leads us to recognise that we are currently experiencing a harmful situation. The range of responses to this issue makes it an extremely sensitive area and one in which as a community we must seek to keep the rights of our children to protection paramount. Our educators will keep families informed of the use of the curriculum and can provide supporting strategies to reinforce concepts at home especially in the sensitive issues such as anatomical names for body parts, children’s rights over the privacy of their bodies, recognising abuse and reporting abuse to someone they trust. Protective strategies can not be employed unless children recognise situations of actual abuse or potential abuse. It is important for children to develop knowledge about what constitutes abuse and skills to protect themselves, that are appropriate to their age and stage of development. For example, for younger students the term ‘abuse’ is addressed within the curriculum by the use of terms such as ‘unsafe’ and ‘unfair’. The themes are then developed in growing complexity in accordance with the age of the learners. The KS:CPC supports our staff in dealing with this challenging and sensitive area of health and well-being by providing age appropriate lessons, topics and activities as well as providing resources for students from culturally or linguistically diverse backgrounds and for students with disability. As adults we are all responsible for keeping children safe, this curriculum does not replace the parent/caregiver’s responsibility to protect children and ensure their safety and is not putting the responsibility on the child. It is designed to complement parents/caregivers’ roles and provides support for the learning of children. The program is informed by a fundamental belief that children have a right to physical and psychological safety at all times and that by arming them with skills and strategies to recognise their feelings and take appropriate action or seek help we give them another circle of protection. If you have any questions or concerns about the Child Protection Curriculum and would like further clarification please make a time to chat with your child’s teacher, your area Team Leader or please feel welcome to contact Nicole or Paul directly. It is through awareness and preparedness we act to prevent harm.